Now here is where the fun really begins, it's not every day you land a robot on the moon! The Breaking Stage solid motor is used to reduce the spacecraft's speed on its approach. The direct descent landing trajectory chosen means the Lander can touch down just after lunar dawn allowing the maximum amount of time to complete the mission but also requires the timing of this burn to be very precise. To achieve this precision an on-board timer is used to trigger the ignition when the Lander passes through a specific lunar altitude. After the Lander separates from the Breaking Stage it follows a gravity turn trajectory (illustrated in the image) to the surface using its own rocket engine to control its descent. During the final approach to touchdown the Lander determines its altitude and vertical velocity using a small radar altimeter and its horizontal velocity by a landing camera coupled with the altimeter and rate gyros. Finally, after travelling a quarter of a million miles, the Lander touches down on the moon's surface and prepares to deploy the Rover and complete the GLXP mission. Simon O'Reilly is the PR Manager for White Label Space and in that role he also looks after the team's social media presence. Simon has a keen interest in astronautics, theoretical physics and astronomy and has read extensively on these subjects. He received a First Class Honours Degree from Trinity College Dublin in Mechanical and Manufacturing Engineering where he studied various modern manufacturing techniques and processes as well as their organization and management. His final year thesis was on "The Effects of Microjets on Jet Turbulence". Throughout the mission it is vital that the position and orientation of the spacecraft are precisely known so that it can be guided to the chosen landing site on the moon. Standard ground tracking techniques are used to accomplish this. Soon after the Trans Lunar Injection burn and stage separation, a first Mid-Course Manoeuvre (MCM) is performed using the Braking Stage Reaction Control System. A sufficiently large delta-V for the MCM is provided for this burn that serves to compensate for injection inaccuracies of the solid motor. One or more subsequent MCM manoeuvres are performed throughout the rest of the lunar transit to accurately target the landing site. Following this the breaking stage is used to slow the spacecraft to a safe velocity for landing on the moon. The orientation or attitude of the spacecraft is critical at all stages of the mission. After the Trans Lunar Injection stage is complete the spacecraft stack begins its three day long journey to the moon. The difference in temperature between the side exposed to the sun and the side in the shade can be as high as 135 degrees. This temperature gradient can cause structural damage to the spacecraft and effect the performance of the Breaking Stage solid motor. To ensure that the temperature is distributed evenly a monopropellant Reaction Control System (RCS) is used to slowly spin the spacecraft about the flight axis. The RCS is also used to perform any Mid-Course Manoeuvres (MCMs) needed during the lunar transit and to optimise the spacecraft's attitude for the breaking burn on approach to the lunar surface. The White Label Space engineering team conducted a first proof-of-concept test of a new concept for impact absorbing legs. Making best use of available hardware, the team integrated the new trial leg assembly on the existing mock-up of the lander. A sensor system was used to measure accelerations during the drop. The Polar Satellite Launch Vehicle can be used to launch the spacecraft stack into Geostationary Transfer Orbit (GTO) but then a second rocket impulse is needed to transfer from this orbit into the Lunar Transfer Orbit (LTO) required to complete the mission. This part of the mission is referred to as the Trans Lunar Injection (TLI) stage and is accomplished using a Star30BP solid motor. The spacecraft is first stabilised by spinning it about its flight axis using a small motor which thrusts in the tangential direction before the Star30BP fires to inject the stack into LTO. A yo-yo de-spin mechanism is used to slow the craft's rotation after the TLI stage is complete, a video demonstrating a yo-yo de-spin can be viewed here. If either the Soyuz Fregat or Falcon 9 launch vehicle is used then the spacecraft stack is placed directly in LTO so the separate TLI stage rocket is not needed. Every space mission begins with a rocket launch and the mission planned by White Label Space is no different. The launch will place the spacecraft in a parking orbit above the earth before it is propelled further to LTO (Lunar Transfer Orbit). From here the spacecraft follows an orbit which brings it increasingly under the effect of the moon’s gravity until, after a three day journey, it reaches the moon. 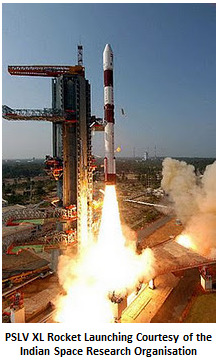 The launch will be carried out using one of three low-cost launch vehicles with which the spacecraft stack designed by White Label Space is compatible; the Polar Satellite Launch Vehicle (PSLV-XL) developed in India, Russia’s Soyuz Fregat or SpaceX’s Falcon 9. The larger size of the Soyuz Fregat and Falcon-9 launchers allows for additional payload capacity. These launch vehicles could carry one or more other passenger spacecraft to LTO, potentially including other GLXP competitors. This would considerably reduce the launch costs incurred by each organisation and so offers a clear financial advantage to any private or government funded missions. While the Soyuz and Falcon launch vehicles can deliver a payload directly to LTO the PSLV-XL does not have this capability and so an additional rocket would be needed to perform what is known as a TLI procedure (Trans Lunar Injection). Once the TLI stage rocket has inserted the stack into LTO, it separates and is discarded, leaving the three remaining components of the spacecraft stack; the braking stage, Lander and Rover, to continue on their course to the lunar surface. White Label Space GLXP team has teamed up with MINES ParisTech, one on their new CubeSat project, ThermoCS. MINES ParisTech, also known as École Nationale Supérieure des Mines de Paris, is one of France's most prestigious engineering schools and provides post graduate education to some of France's top university students (see more information here). The CubeSat is planned to contribute to the QB50 project, a constellation of 50 nanosatellites organized by the European Commission. White Label Space will provide a secondary payload as part of its GLXP mission developments. 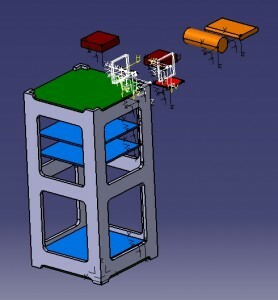 The primary payload on the CubeSat will be the standard QB50 sensor suite designed to study the physical phenomena in the lower thermosphere, the of space and upper atmosphere in the 90-320km altitude range. This video (in Japanese) shows highlights of the White Label Space Japan Fun Meeting #3. 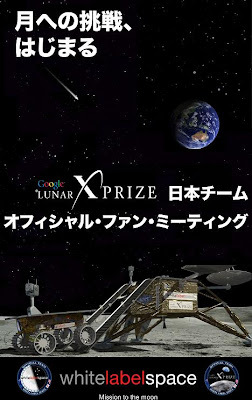 The Fun Meetings, held at the Tokyo Culture Club, are a way for the Japanese public to learn about White Label Space and stay up to date with the team's progress on its Google Lunar X PRIZE mission. In this video, chapter 1, Takeshi Hakamada, the CEO of White Label Space Japan, discusses the recent press conference that was organized in Tokyo to unveil the rover prototype, as well as explaining some of the background motivations of the GLXP. In this video White Label Space team scientist Mark Bentley discusses two recent lunar science topics that could be further investigated with experiments on GLXP missions. He explains the "Two Moons Hypothesis" as well as a fluid drilling technique that could assist lunar science. The White Label Space GLXP Team is preparing a Structural Model of its lunar lander using Carbon Fibre Reinforced Polymer (CFRP) sandwich panels provided by the team's partner Airborne Composites. Did you ever wonder what it would be like to be a hot new technology item on display at a Japanese press conference? Well, probably not, but you can see what it looks like anyway in these awesome 360 degree scrolling panoramas taken by our rover's camera during the conference. To scroll, just click on the image the move the mouse left or right. Your web browser will need shockwave flash installed and not blocked. This weeks guest blog post, on the commercialisation of space exploration is from a our friend Ted Manning the Co-Chair for Space Events over at MIT/Stanford VLAB. Commercial Space -- What's the Next Step? The final flight of NASA’s space shuttle program, just concluded with the return of Atlantis, marks the end of an era. It is a milepost in the transition of space exploration from the realm of governments to that of private enterprise. Indeed, NASA now wishes the task of transporting its astronauts to low earth orbit--to such destinations as the International Space Station (ISS)--to be handed over such commercial outfits as SpaceX, Sierra Nevada, and Blue Origin. This way NASA will be able to focus more on “real exploration” deep into the solar system. But the future of commercial space is not one-dimensional, to be limited to a service for government space needs. Granted, there always was a space market for large commercial interests, mainly for telecommunications, but the barriers to entry have always been monumental. Today, a shift in government policy, technology, and simply a critical mass by those seeking the new opportunities is underway that will ease space access and may make smaller private space concerns ever more possible. The grand promises of space are well known: from low earth orbit any part of the planet can accessed from above for communications, earth imaging, and unlimited energy production. The weightlessness experienced in orbit has long been understood as one key to the development of exotic materials and pharmaceuticals. And space is the ultimate destination for humans, for the unbeatable view and unmatched experience. There are a spectrum of new space-based business opportunities emerging and a surprising variety of players vying to grab a piece of space via a number of avenues. In an era where of everything needed in a satellite can be packaged in your iPhone (as micro-, nano-, even pico-satellites), getting to low earth orbit via established and new heavy launchers through “piggy-backing” or boosted off of upcoming suborbital vehicles powered by hybrid rockets may soon become de riguer. What can be done with fleets of tiny, low cost satellites? Space tourism may become another driver, where getting to space (if you include the suborbital variety) would no longer require $20 million+ and a year of astronaut training, be more down to earth with perhaps no more training than you would need for skydiving or scuba diving. Even your mom could enjoy the view, perhaps someday from a space hotel. Date/Time: Tuesday, September 20, 2011, 6pm reception, 7-8:30pm panel discussion. NOTE: Early bird pricing $30 before midnight Friday, Sept. 9, $40 before midnight Friday Sept. 16, $50 thereafter. With reduced government funding for space programs, the outlook is shifting away from traditional space organizations over to the funding of private entrepreneurs. The coming years are projected to see a dramatic growth in technological innovations and new business models – only paralleled by the Internet growth in the 1990s – and universal access to space. Entrepreneurs are now exploring opportunities with new rocket launchers, novel uses of affordable small satellites, space tourism, and even space-based power generation and extraterrestrial mining. How can entrepreneurs successfully launch new ventures in the space industry? Who will fund highly front-loaded capital requirements? What business models are effective? How will technology commercialization mesh with market windows? What about multi-national regulatory incompatibilities and industry incumbents? Space has always been a petri dish to breed new technologies that later penetrate our everyday life. Discover the latest developments and learn how private investors and businesses are planning to overcome capital intensity and provide new solutions for our problems on Earth. The MIT/Stanford Venture Lab (VLAB: www.vlab.org) is the San Francisco Bay Area chapter of the MIT Enterprise Forum, a non-profit organization dedicated to promoting the growth and success of high-tech entrepreneurial ventures by connecting ideas, technology and people. We host the largest ongoing gathering of Silicon Valley entrepreneurs, venture capitalists and thought leaders at our monthly events at the Stanford Graduate School of Business, with an ecosystem that includes 25,000+ Bay Area influencers. White Label Space is looking for a researcher interested to do a feasibility study on lunar regolith anchoring technologies and lunar construction techniques. This project will involve interaction with a partner organization that is developing a lunar regolith testbed and coming up with a conceptual design for a demonstrator payload to be flown on our Google Lunar X PRIZE mission. The demonstrator would have a scientific function as well as demonstrating novel techniques for regolith interactions. The project would be ideal as a university project, but we are willing to work with anyone who has the time and knowledge to contribute. No funding will be provided for this project however the results will be promoted via our website and online media and the researcher will have access to technical support from the White Label Space engineers and scientists. 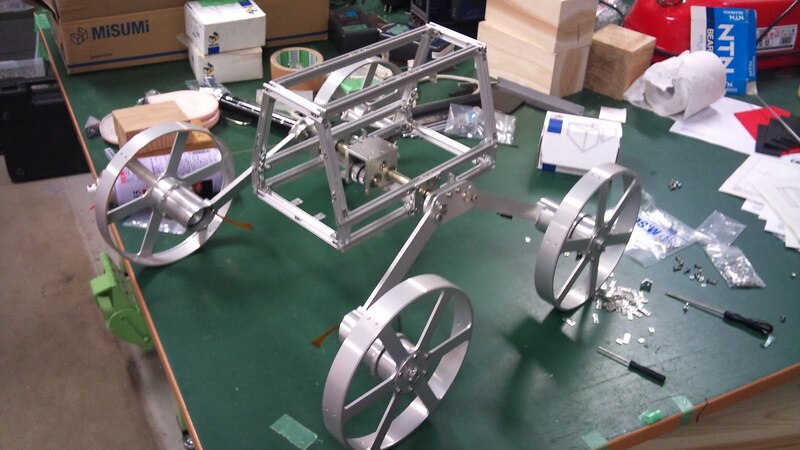 On the 28th of August 2011, White Label Space held a press conference in Tokyo to present the team's lunar rover prototype. This video shows some of the highlights of the event. The press conference was organized by White Label Space Japan LLC, the team's commercial branch in Japan. 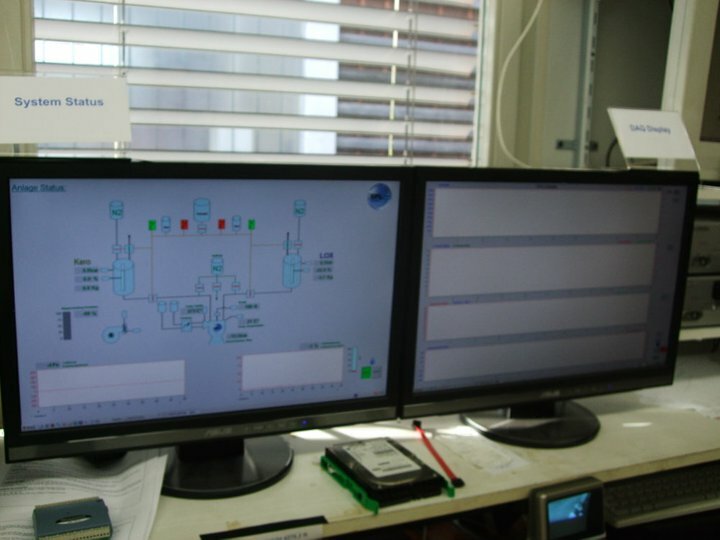 Safety comes first in rocketry, and that's why our partner the Swiss Propulsion Laboratory developed this custom fire control system to operate their rocket motor test bench from a remote and safe location. The computer screen shows them telemetry from sensors on all the critical equipment allowing them to monitor the test results in real-time and, if necessary, make safety-critical decisions. 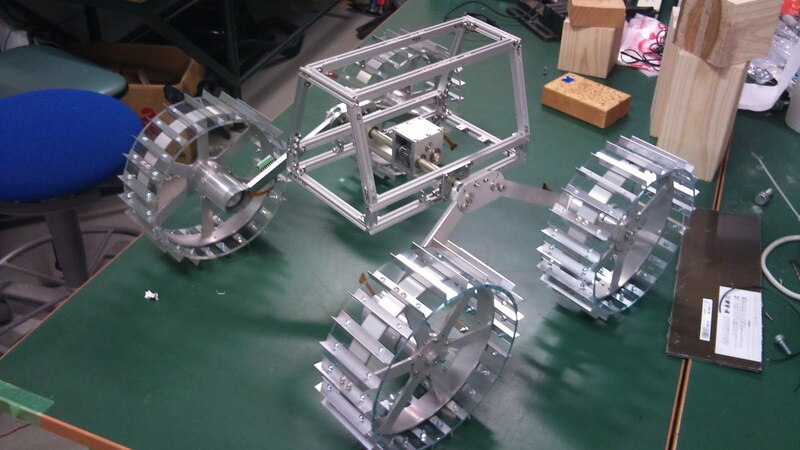 Dhanushka Liyanage, Guidance Navigation and Control (GNC) engineer for White Label Space, has constructed a quadrotor vehicle as a testbed for GNC algorithms that will be used on the lander for our Google Lunar X PRIZE mission. This video shows a test with manual manipulations of the quadrotor thrust levels. Dhanushka is now working on the basic flight control algorithms to achieve sustained hovering. The White Label Space Rover prototype will be officially presented to the media and specially invited guests during a press conference on Monday 29th August in Tokyo. The White Label Space team members in Japan prepared this video to promote the event. More progress from the White Label Space propulsion team - this video shows a short firing test of a development motor, a stepping stone towards the engine that will eventually power our lunar lander. Our partner the Austrian Space Forum (OeWF) found this cool way to spend a hot summer's day in Innsbruck - water rockets! For our GLXP lunar lander's main engine we have been closely investigating designs with two possible oxidizers - hydrogen peroxide and nitrous oxide. First and foremost these propellants are non-toxic and thus are more desirable from the safety point of view compared to the toxic ones typically used for government financed lunar spacecraft. The additional safety coming from non-toxics reduces the development time and costs, making the development feasible for our small team which has only limited finances. Secondly, both these propellants can be used in mono-propellant mode by passing them through a catalyst pack (here nitrous has the small disadvantage of requiring pre-heating for its catalyst pack). The specific impulse in monopropellant mode is not terrific so we have selected a bi-propellant system for the main lander engine, combing the oxidizer with a kerosene-type fuel. However, the monopropellant mode is quite useful for secondary thrusters for attitude control, which don't require high specific impulse, or for a deep throttling mode of the main engine that might be useful for the final touchdown when the lander's mass is low. Both the oxidizers have a long heritage in both professional and amateur rocketry so there is lots of information available for guiding the design process. Indeed, we have already complete preliminary designs for engines of both types. However, there is one more factor that is very important for our thinking - the availability. Unlike hydrogen peroxide, the availability of nitrous oxide presents no difficulties. It is widely used across many industries, is cheap, and can be shipped almost anywhere when needed. Another oxidizer option that is frequently discussed is liquid oxygen. This is non-toxic and relatively easy to handle as well as giving great performance. However, we rule out liquid oxygen due to the uncertainties in thermal conditions that will be encountered during out mission, which make it impossible to accurately and reliably predict the boil-off fraction. Also we consider the development of a space-qualified re-condensor system as not realistic given the timeframe and finances available. As a result of the above considerations we have selected nitrous oxide for our first prototype rocket motor, which we plan to demonstrate in the fourth quarter of this year. The main downsides of nitrous oxide are its requirement for pre-heated catalyst (if a monopropellant mode is used) and its vapor phase transition behavior, which give extra complication compared to hydrogen peroxide. For these reasons, we plan to keep the option open to go back to hydrogen peroxide later if the availability issue can be solved. Next up in our series of sample ads linked the Google Lunar X PRIZE, this ad looks at how our robotic lunar mission could be used to advertise a solar cells company. 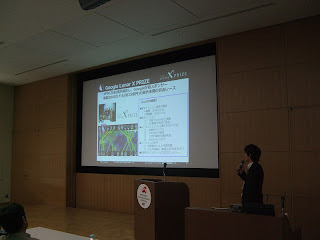 Andrew Barton and Takeshi Hakamada gave this presentation at the GLXP Team Summit earlier this week. 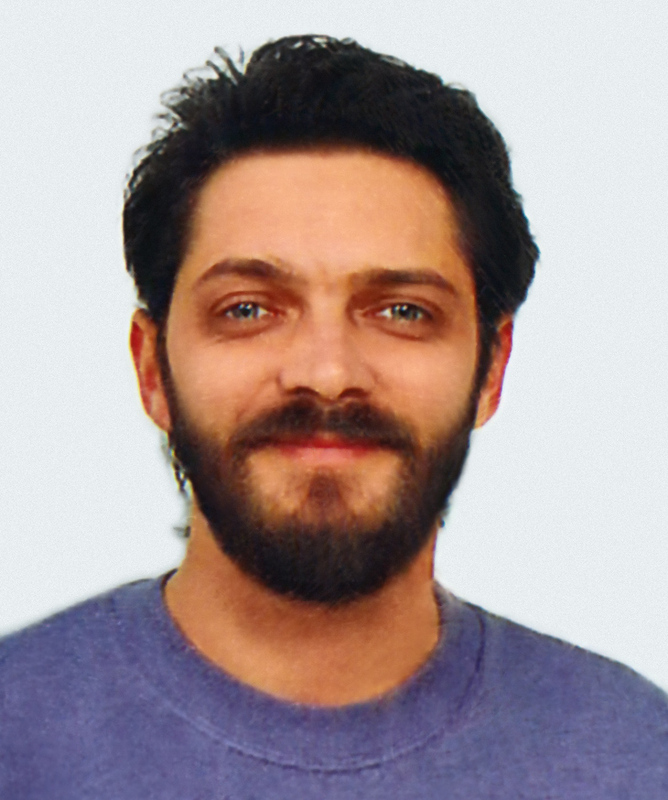 Kristhian Mason is a member of the White Label Space video editing team. Kristhian has worked as a professional graphics artist for 14 years, and is specialized in making layouts and retouching pictures. He is the Creative Director for the Space Safety Magazine of the IAASS (International Association for the Advancement of Space Safety) and ISSF (Internatonal Space Safety Foundation), making the newsletters, flyers and magazine ads. Peter Brown has just published this article about White Label Space in his new blog called Japanese in Space. The article includes comments about our activities in Japan by our chief rover designer, Professor Kazuya Yoshida, and by Takeshi Hakamada, the CEO of White Label Space Japan. Our team leader Steve Allen also gave some insight on the overall challenges facing the team and what motivates the team members to perform. This video shows lapse footage of a recent engineering meeting of our GLXP team... with some funny extras! We want sponsors to support our mission for the Google Lunar X PRIZE (GLXP), and what better sponsor than a maker of electric cars! This ad, made by the White Label Space creative team, is a sample of how a fictitious automotive brand (we call it "White Label Electric Cars") might use our mission as part of an ad campaign. Rio Tinto TV Documentary: Newton 14.05.2011 - Erobern Österreicher den Mars? Last May, the Newton magazine released a TV documentary by Elisabeth Pfneisl and Erich Proell about the Rio Tinto 2011 Mars simulation mission, where White Label Space performed some tests on its Lunar Lander Mockup. This news report (in German) covers the entire Mars Analog mission, including the ESA's Eurobot tests, the new Aouda.X spacesuit, and the rovers tests. We need to clarify that when they introduce White Label Space in the report, they described us having won the Google Lunar X PRIZE, which is clearly a mistake. We were there to test our lander mock-up and omnidirectional camera, as well as to get feedback to support our future work. Enjoy the journey through the Rio Tinto Mars Analog Mission 2011 with this video. 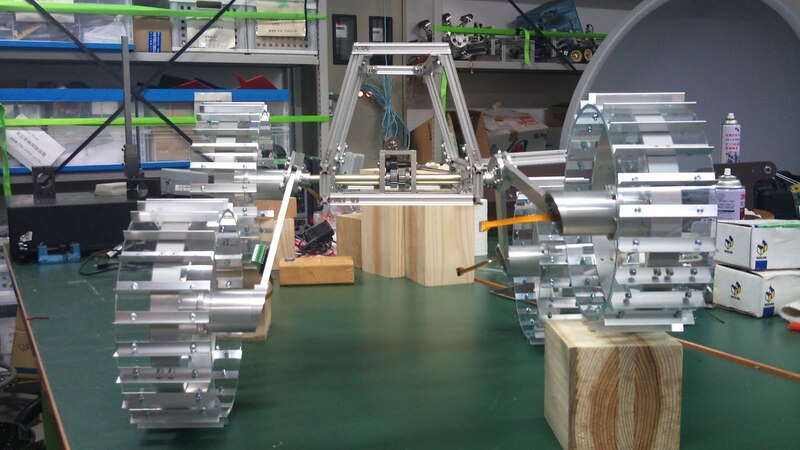 Audrey Lan Sun and Rachel Dompnier talk about their project to research and design a concept for the White Label Space lunar rover control center. Can advertising by global brands finance ambitious space exploration missions like our Google Lunar X PRIZE mission? This chart compares the budgets of various space agencies with advertising budgets of global brands. The global brands shown in the chart were selected from industries with the strongest opportunities for brand linkage advertising on our GLXP mission, namely: Automotive, Electronics Technology, Telecommunications, News & Entertainment and Finance. Any of the companies listed in the chart could finance our complete mission with less than 10% of their annual advertising expenditure. More likely, our mission will be sponsored by a number of different brands, and development costs will be spread over a number of years. 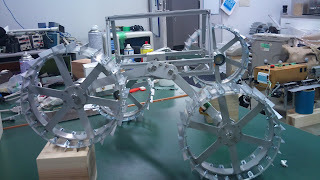 Nathan Britton at Tohoku University Space Robotics Lab has sent through these latest photos of the rover prototype. 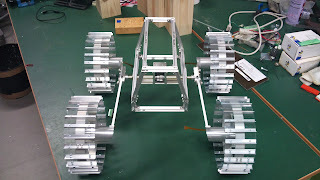 The suspension has now been integrated on the frame of the body. The prototype is on course for its first driving demonstrations next month. This month 3.4 million readers of Germany's GEO magazine will read about the White Label Space team's participation in the Google Lunar X PRIZE (GLXP). The article includes a great two-page photo showing White Label Space team members working on the lunar lander mock-up, and photos of our partners Airborne Composites and AOES Group BV. With over 3.4 million readers, GEO is one of the largest monthly magazines in Germany. GEO also publishes international versions in a number of different languages. The article, titled "Google Lunar X Prize: Die Mondsüchtigen", features in issue 06/11 of the Germany language edition, and also covers a selection of the other GLXP teams. 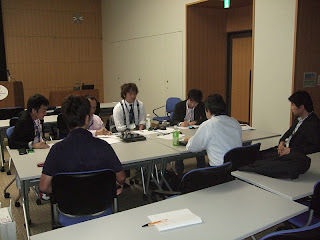 This technical meeting of the White Label Space engineering team was held on the 19th of May 2011. The discussions were led by Dr Jeremy Fielding, the lead system engineer for the lander, and centered on the question of what should be the next steps after the successful demonstration of the lander mock-up at the Rio Tinto field trials. During the video the team can be seen setting up the lander mock-up to assist the discussions. Carmen Felix, who participated during the field testing of the lander mock-up in Rio Tinto, Spain is now joining the team as a permanent member. Carmen is an Electronics and Communications Engineer, and holds a Master in Space Science from the International Space University at Strasbourg, France. 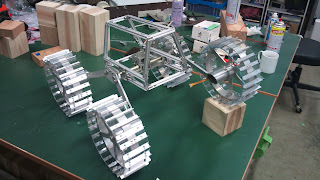 Carmen will be collaborating with WLS with testing, and with the communications between the lander and the rover and with the ground station. Carmen has experience working with companies as aT&T and Texas Instruments in the areas of networking protocols, communications and testing. During 2010, she worked at NASA Ames for 8 months as an intern researcher for the Small Satellite Division, at the Mission Design Center. Her professional experience will be valuable for White Label Space. Carmen has experience in leadership and management, and she also holds a Radio Amateur Technician License, a Windows Embedded CE 6.0 Developer Certification with a Diploma of Excellence, a CCNA certification and different courses of wireless communication, WiMAX, GSM, GPRS and EDGE. She likes to help education and young people, and currently she managed to send a group of Mexican high school kids to participate in STEP NASA program as the first foreign participants. 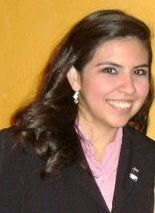 She is the National Point of Contact in Mexico for Space Generation Advisory Council for the United Nations, and has been participating in different space conferences and symposiums, as the last two ISU annual symposiums, World Space Congress, Americas Space Conference, conferences of the Mexican Space Agency and many others. Takeshi Hakamada, the CEO of White Label Space Japan, gave this interview podcast for Evadot. In the interview Takeshi answers questions on topics including the meaning behind the name 'White Label Space' and the team's upcoming activities in Japan. This video carries on from our earlier video from Rio Tinto and shows White Label Space team members Andrea Gini and Carmen Felix testing some concepts for rover operations and cooperative robotics on planetary surfaces. Although the Rio Tinto event focuses on simulations of Mars missions, there are many common challenges with moon missions such as ours for the Google Lunar X PRIZE. White Label Space will continue to make use of such opportunites to test our hardware as it is developed. One question has been bugging me for a long time. How do you quantify the 'size' of a team of volunteers preparing a mission to send a robot to the moon? Scroll down to the bold highlighted sentence about half way down this post if you want to see the first real answer to this question! The difficulty in giving a good answer is that members come and go over time, and the amount of effort any individual puts in depends on many factors - how busy their day job is, whether they live near to other team members, births of their children, how motivated they are, whether they have skills that we can make effective use of, etc. What I already knew is that over 240 people have contacted us, sending their resume asking how they can help the White Label Space team. In most cases we were able to assign them to a sub-team or give them a specific task to work on, however that still leaves the problem of keeping track of all those distributed members. So I decided to do a little survey..
As expected for any volunteer project, the distribution of efforts forms a Long-Tail Distribution, with a minority of the members putting in large amounts of effort but a lot of members putting in a small effort. From the 24 members who answered so far (and more answers are expected to come in), the efforts ranged from 816 hours to 0 hours, the latter being a brand new member. The total effort over the last year was 4906 hours, which corresponds roughly to 2.4 standard full-time working years. Thus, if we were a normal company, it would still be a rather small one (although 2.4 full-time employees is nothing to sneeze at!). However, in such analysis one should also consider the value that comes from having such a large number of people involved, each bringing their own experience and network to the team, not to mention the fact that they are distributed across more than 10 different countries. Considering this, it's no surprise that White Label Space has been a strong performer in the Google Lunar X PRIZE (GLXP) so far. 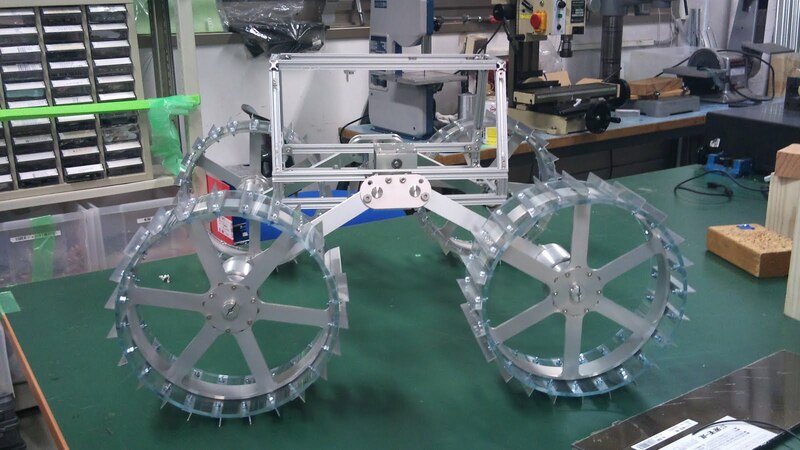 Our team at Tohoku University is making excellent progress on a fully functional rover prototype, and our Netherlands-based members have built a very realistic and attractive mock-up of the lander, which was deployed at the recent Mars analog field trials in Rio Tinto. Aside from this, we are making steady progress on a realistic and affordable engineering design of our GLXP mission and our Japan Office is preparing some exciting activities that promise to engage a huge audience in that very important and technologically advanced country. Finally, we now have a team of video editors in place making professional video content to communicate our work to the world, engaging potential sponsors and partners. So don't take quantified answer to the blog post (2.4) too seriously. This team is showing what's possible when 100% pure passion is your rocket fuel and motivation is your oxidizer! 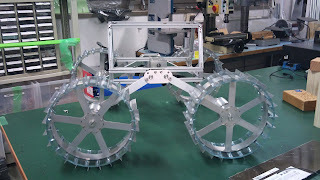 The team at Tohoku University are making steady progress on the construction of the rover prototype. 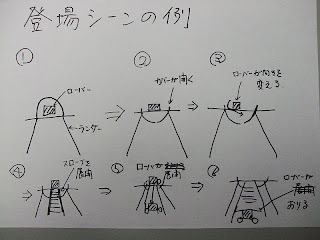 The picture below shows the suspension integrated to the body frame. The wheels are now being made from acyclic polymer tube and will be attached next week. Probably due to the Sendai Earthquake, there have been some serious delays with the manufacturer of the new camera and the laser range finder, but the delivery of those components is expected next month. First demonstrations of the rover prototype are scheduled for July, with some significant software progress by September. 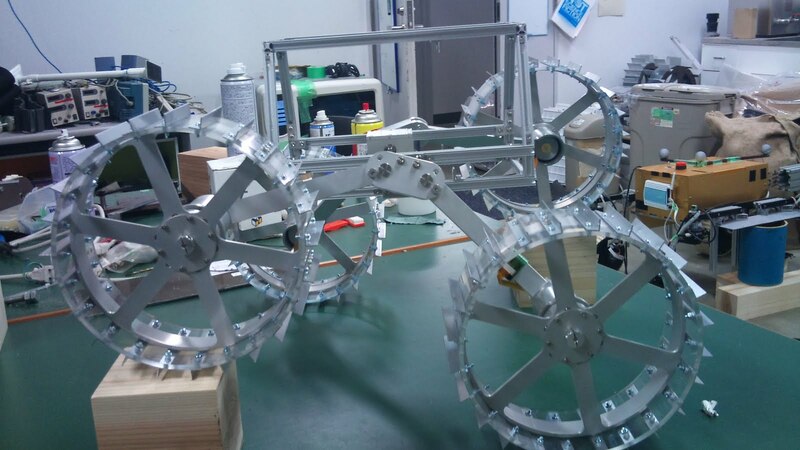 The rover will be ready to perform a mock-GLXP mission on Earth by the end of this year. Work will then continue through 2012 on the rest of the software, navigation strategies, verification of the wheel configuration and installation of all electronic systems. Do you want to be part of a revolution in private sector lunar exploration? Nine months after the official White Label Space kick-off event in Japan, the team has reached the end of the planning phase and its spectacular moon mission is about to get underway. This event will begin with an overview of the team's activities, and then move into an open discussion where everyone is free to interact with the team members, exchanging opinions and ideas or to ask questions about mission. Splinter meetings on specific themes will also be held. The aim of the discussions is to formally adopt the team's mission plan. Share your ideas, take responsibility and be part of a unique team as it undertakes the first ever open space development. This is a once in a liftetime chance to see dreams becoming reality! 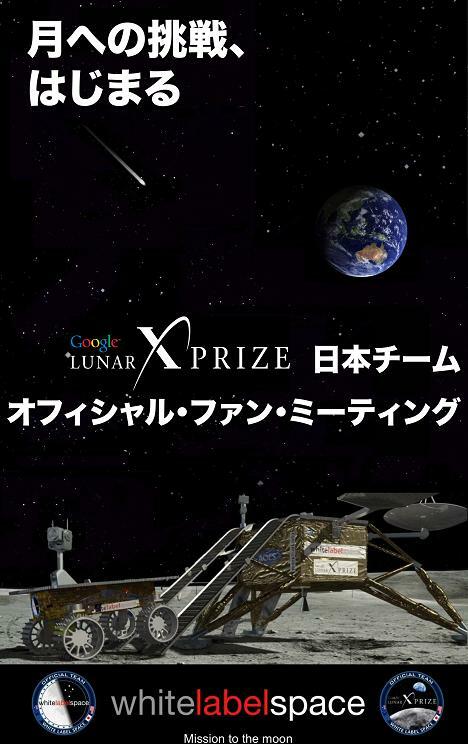 The Google Lunar X PRIZE is a race for unmanned lunar exploration with US$30 million in prize money sponsored by Google. The competition involves 29 official teams from 18 countries, and White Label Space is the only team in Japan. In addition to aerospace engineering professor Kazuya Yoshida of Tohoku University, the team also includes professionals in PR and advertising and management consultanting, as well as young researchers working in diverse fields of the arts and sciences. So to attend this event you are not expected to be a rocket scientist or astrophysicst - creative contributions are sought from everyone! Please join us at this participatory event and become part of the new wave of open space development! An official fan event for the Japanese team participating in the US$30 million competition for robotic lunar exploration. GLXP overview and introduction of the activities of the mission team. Participants can exchange ideas freely with other members and questions and ideas unmanned lunar exploration mission. Thematic group discussions will also be held. Admission is strictly limited to available seating according to numbered tickets. The Austrian Space Forum (OEWF) has published their final report of the 2011 Rio Tinto Mars Analog event, inlcuding conclusions from the White Label Space team. White Label Space would like to thank the OEWF for organising a fantastic event and we look forward to cooperating on even bigger and better things in the future! This video taken during the Rio Tinto field trials shows some of the difficulties of doing outdoor testing. The video includes interviews with the two team members who were responsible for the White Label Space activities, Carmen Felix and Andrea Gini. Thanks should also go to the new team member Vasco Nunes who provided assistance. 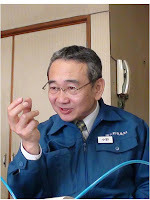 Ono Denki (denki being Japanese for "electronic") is known well among the Japanese robotic community and has produced several prototypes for leading researchers. In mid-January 2011 White Label Space asked Ono Denki to produce the suspension sub-assembly of the team's prototype rover, currently under development at Tohoku University's Space Robotics Laboratory. The work was delayed by the Sendai Earthquake which affected certain parts suppliers, but Ono Denki successfully completed hardware by the 11th of April. 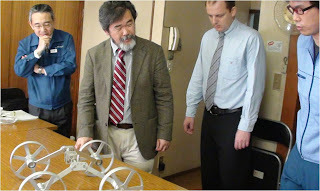 The final delivery and inspection took place during a visit by WLS Chairman Dr Andrew Barton and Professor Yoshida of Tohoku University, who is responsible for developing the team's rover. 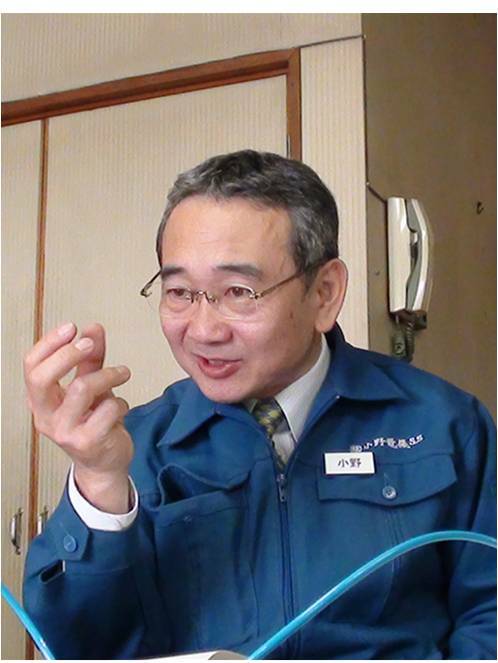 The photo (left) shows the suspension sub-assembly that Ono Denki produced. 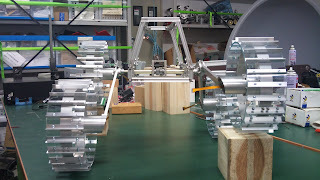 The body of the rover interfaces to the block in the middle. 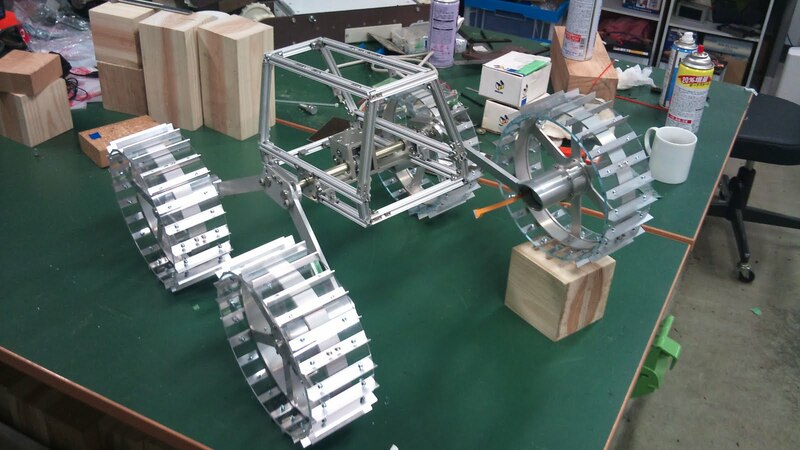 The rest of the rover prototype is now being integrated and WLS will hold an unveiling ceremony in mid-2011. Ono Denki was founded in 1938 and has a long history. The company's CEO is Mr. Ono (pictured right). He is the third generation of his family responsible for the business. A key strength of Ono Denki is the capability to support the entire process from design, machining, assembly, board, wiring, and software development all the way through to final testing and evaluation. The company has several engineers specialized in each of those phases. Thanks to the close communication among engineers involved in each process, Ono Denki provides very high quality to its customers. Ono Denki has also provided space development-related equipment for JAXA (Japanese Aerospace Exploration Agency) and many others. In 2010 in an article by Diamond Weekly, a popular business magazine in Japan, Ono Denki's activities in the space industry were highlighted. A common belief in Japan these days is that that small companies are in danger of disappearing due to a lack of people interested in carrying on the business. This leads to a fear that the nation's technology level will get suffer due to the loss of know-how. However, steady stream of excellent young engineers who are receiving guidance and mentoring from skilled personnel ensures that Ono Denki will continue to thrive into the future. In 2010 Chevrolet's ad compared its newest model to the golden time of American rocket science. In 2011, on the other side of the Atlantic, Renault is training its scientists for Mars!! "The French car manufacturer Renault has already used the space exploration theme by showing its Megane on the Moon, not to mention a Clio that attempted to blast off like a space shuttle. This time, it promotes the merits of its special offers for March by showing that its employees have undergone training for Mars (a play on words as the word for the planet and the month are the same in French!). In the advertisement ... you will notice the numerous allusions to well-established stereotypes from the space industry and, more particularly, the training with a centrifuge, a pool for spacewalks and a simulator. Worthy of note towards the thirtieth second of this commercial is the clear allusion to the great classic “The Right Stuff” with the men and women from Renault walking towards the camera against a white background just like the astronauts from Mercury in the 1983 film. Then, in the next shot, don’t miss the Renault building obviously inspired by NASA’s symbolic VAB at the Kennedy Center in Florida!"